Hollybeary Creations : YNS Sneak Peek!! Happy Saturday everyone... Who's ready for a Peek at the March Release from Your Next Stamp? Be sure to join us Tomorrow for a Blog Hop and all the products will be available in the Shop! I'm using the super cute new set Hey Chickie and the Coordinating dies. I created a Watercolor background on a piece of Watercolor Card stock and Die cut it using the largest Stitched Rectangle Die. Then I stamped "is here" in the lower corner and heat embossed it in White. I adhered the panel to a Bright Blue card base using some Foam adhesive. I die cut Spring from some White card stock 3 times and adhered them together to create some dimension. Then I adhered it to the center of the card front. I stamped the chicks onto some White card stock and colored them in with Copics and die cut them with the Coordinating dies. Each chick is adhered with some foam adhesive as well. For a bit of bling I added a few glittered Give Thanks Gumdrops and a touch of Clear Wink of Stella to the Chicks. 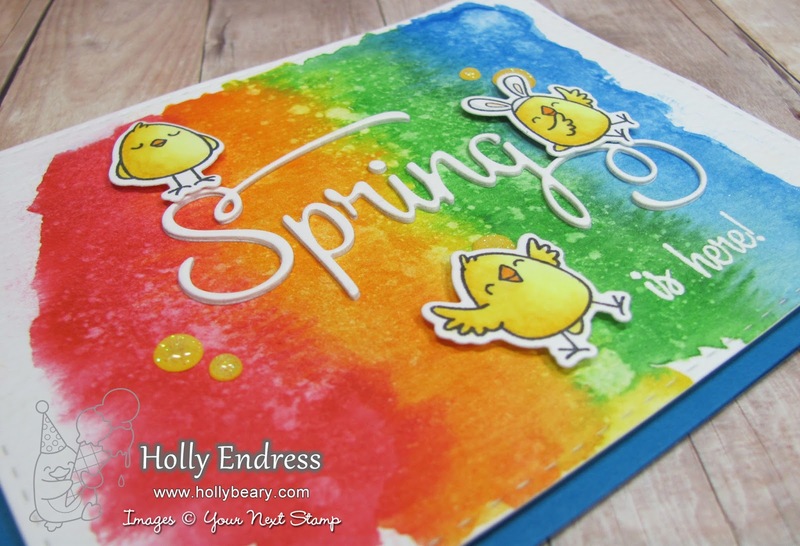 Head over to the Your Next Stamp Blog to see more great Sneak from the Design Team.. and don't forget to join us for the Blog Hop tomorrow! Great colors! So cute card! Fun card! Those chicks are enjoying spring! 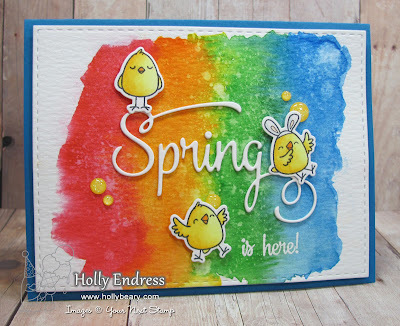 Love the bright watercolor background! Such a fun card! I love the layout and those chicks are simply darling! Love this Holly - that background is amazing! Nice and colourful card. Really liking the spring die. Super fun card! LOVE the background you created!! Eeeek! How fun and adorable this is!!! 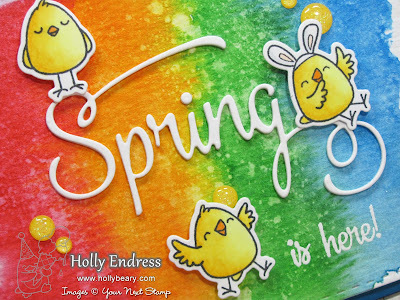 Great colors and LOVE the sweet chicks! Adorable! Love the watercolor BG! Thanks for sharing! Adorable card! I love the background and the images are so cute! Oh I love how the chickies are playing on the dimension word, spring! So playful and cute! Love this cheery and bright card! !